The municipality of Puerto Tejada is in Cauca Department.It was founded on 17 September 1897. 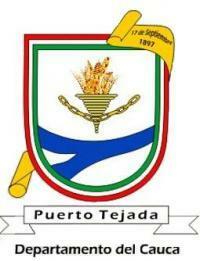 The flag of Puerto Tejada is horizontally divided red-white-green and charged with the municipal arms at its center. No details are provided either on the flag or the coat of arms. The shield has a red-white-green border. The scroll on the upper right part of the shields bears, in black characters, the date "17 de Septiembre 1897", the official date of the foundation of the settlement by General Manuel Tejada Sànchez, who gave his name to the village. Originally a "corregimiento" of Caloto, Puerto Tejada became a municipality in 1912. The white scroll below the shield bears the name of the municipality, in black letters. "Departemento del Cauca" is written, in black letters, below the scroll.